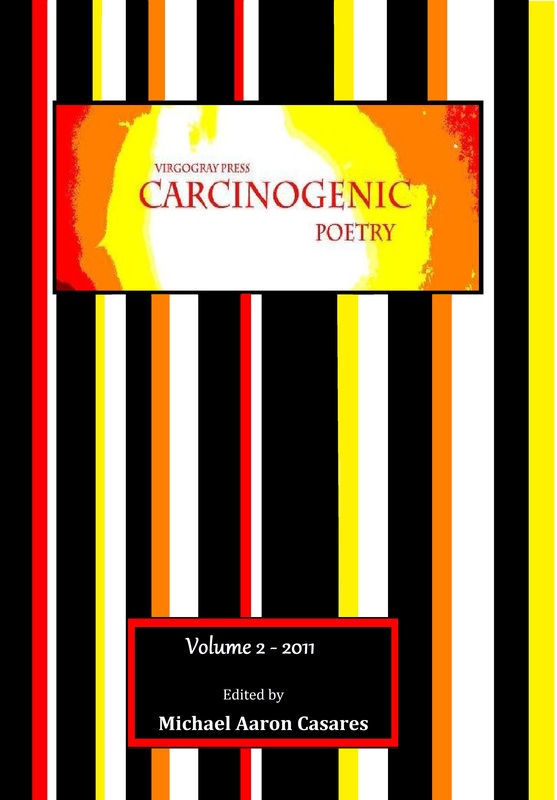 Within the pages of the 2nd annual Carcinogenic Poetry print anthology you’ll find the entire 2011 collection of poetry from the free online blog, Carcinogenic Poetry. This year’s anthology includes over 90 poets from around the world. The writer’s herein are denizens of the indie writer’s world and have appeared in the journals and internet publications that map the underground realm; some are new poets, unknown and unread, but with promise their work graces our pages. Carcinogenic Poetry originally opened on the internet in December 2009. Since then the website has been visited 1000’s of times, our top readership including countries like the United States, Ukraine, Germany, the United Kingdom, Russia, Canada, China, Australia, India and the Philippines, a reason why we sometimes encourage our contributor’s, “Come read, come get read.” We are very happy to have an international list of contributor’s, as well as an international reading audience. The gems contained in the volume are many and include Pushcart Prize nominees, as well as, work previously published in other respective journals. So whether you follow the Carcinogenic Poetry blog on the Internet, or you are a first time reader, I hope you enjoy this contribution to the literary underground and as we, the read and writer progress along the continuum of Carcinogenic Poetry.